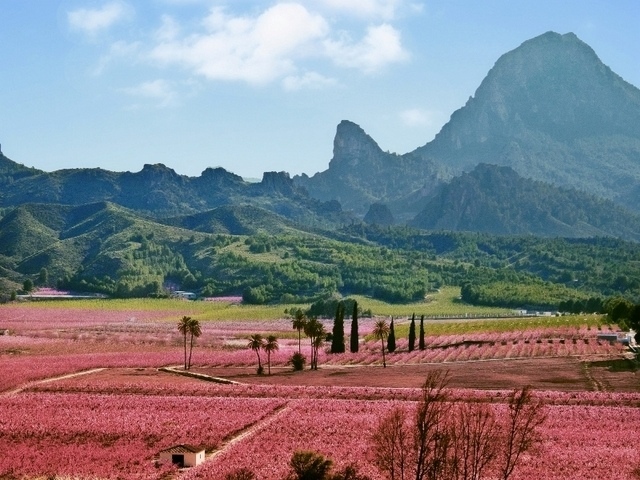 Tirabeques, or snow peas, are common in vegetable gardens of Murcia, Here, they are combined with tender artichoke hearts to create a starter favoured by local chefs. In a large bowl, combine the lemon juice, salt, and the 1/2 cup olive oil. Mix well. Working with 1 artichoke at a time, peel off the leaves completely until you get to the core. Using a small, sharp-edged spoon, scoop out the fuzzy choke that remains, and discard. Cut off the stem flush with the bottom, and trim around the bottom of each artichoke , removing the though outer layer. Cut the bottoms crosswise into thin slices, and toss them into the lemon mixture. Repeat with the remaining artichokes. Add the snow peas to the artichokes, and toss well. Heat a large, dry non-reactive skillet over high heat. When the surface is very hot, lift the artichoke slices from the marinade with a slotted spoon and place them in a single layer in the pan. Sear for 1 minute. Decrease the heat to medium and sear for another minute, or until the slices are nicely browned at the edges. Raise the heat to high, turn the artichokes, and cook for 2 more minutes, again lowering the heat to medium after a minute. Remove the artichokes from the skillet, set aside, and keep warm. Repeat until you have cooked all of the slices. Return the skillet to high heat. When the surface is very hot, lift the snow peas from the marinade with the slotted spoon and place in the pan. Cook, stirring them constantly, for about 2 minutes, or until bright, shiny, and tender-crisp. Remove the snow peas from the skillet, set aside, and keep warm. Heat the remaining 3 tablespoons olive oil in the skillet over high heat. Add the ham and fry, stirring constantly, until lightly browned, about 1 minute. Using the slotted spoon, transfer to paper towels to drain. 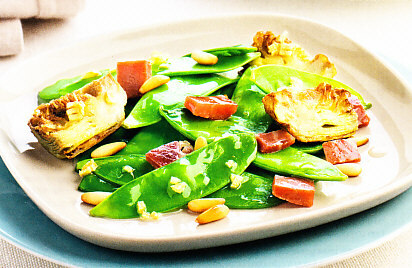 Distribute the snow peas evenly among individual plates, arrange the artichoke slices over the snow peas, and sprinkle the ham on top. Drizzle some olive and parsley around the rim of the plate. Serve immediately while the vegetables are still warm.